Being a successful sales manager means so much more than being a good sales person (although that certainly is a big part of it). You have to be skilled at identifying new talent, know how to run an effective sales meeting, and set and track the progress of goals for your team. Nobody said the job was easy, but it’s certainly never dull. Sooner or later you’re going to find yourself needing to hire a new salesperson and you’ll be faced with that daunting stack of resumes or applications. After you work your way through it deciding who to talk to and who to eliminate, you’ll need to interview the select few to find your next sales superstar. Everybody is (or should be) ready to answer the age-old, “Tell me about yourself”. Many of them have pat answers that sound so great — but they end up being better at being interviewed than they do at selling. (If they aren’t employed) Most great salespeople seldom find themselves without a job. What led to you being here today? (If they are employed) I see you have a job now, what puts you in the market to find another one? Who was the best sales manager you ever worked for and why? Who was the worst sales manager you ever worked for and why? Give me an example of a time when you had to be really creative to either save a customer or make a sale. What’s the last good business book you read? What type of personal development and continuous education are you currently practicing? As you can see, these aren’t your run-of-the-mill interview questions they’ve practiced for over and over. You’re likely to get a good idea of a person’s true capabilities when they have to think on their feet and answer honestly. If they struggle or squirm, let them. Don’t throw them a lifeline and skip over the question. These are meant to be tough. But, that’s the type of talent you want for your department, isn’t it? Here’s a quick checklist you can use to help put on the best sales meeting possible. You may have a few more specific to your industry, but this is a good start and will get you thinking. Also, immediately following a sales meeting, have a debriefing with your key people to see what you could’ve done better to improve your next meeting. The following checklist provides you and your salespeople with the opportunity to write down your goals and use “mile markers” to make sure you stay on target. 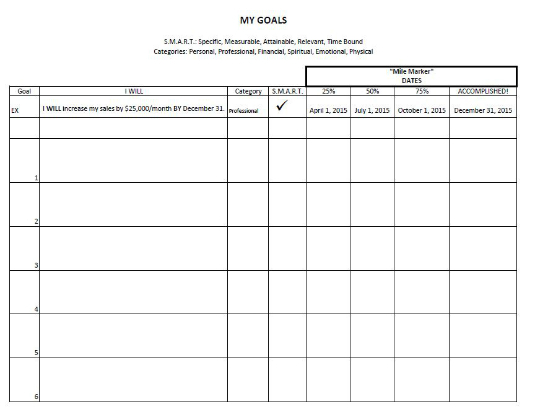 Click here to view a printable PDF of the sales team goals checklist.